The mystery over what the Miami Heat were offering the Minnesota Timberwolves in exchange for Jimmy Butler has now apparently been answered. One new report indicates that two key members of the Heat and a high draft pick were part of the proposed deal that was subsequently turned down by the Timberwolves. 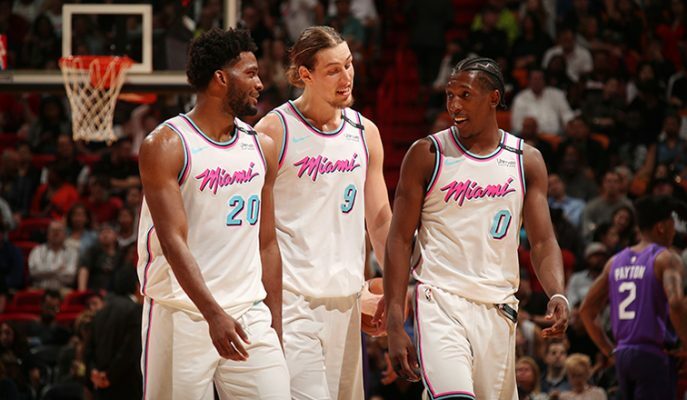 NBA teams aren't exactly blowing away Minnesota officials with offers for ex-Marquette standout Jimmy Butler, Sources say the Heat offered Josh Richardson, Kelly Olynyk and a protected first-round pick. Twolves wisely took a pass. Josh Richardson had originally been one player that the Heat had been reluctant to include in any proposed deal. That approach changed when it became readily apparent that the Timberwolves were going refuse any offer that didn’t include him. In the case of Kelly Olynyk, he had signed with the Heat as a free agent last year. The need to include players of quality was a necessity, but the 27-year-old big man’s modest production on offense wasn’t much of an enticement to Minnesota. With respect to the draft pick, the protected status of that choice also offered the Timberwolves what they considered to be modest compensation for Butler. Based on the first two games of the 2018-19 NBA season, perhaps the Heat should be glad that such a deal wasn’t accepted. That’s because Richardson has averaged 24.5 points, 4.5 rebounds and 4.0 assists in the pair of contests. Meanwhile, Olynyk’s putback served as the game-winner in the Heat’s first victory of the season on Thursday night. While the Timberwolves are hoping that either the Heat or some other team sweetens the pot to obtain Butler, the clock is ticking on any deal. That’s because Minnesota stands to lose the veteran to free agency next July if he’s not dealt away by February’s trading deadline.